It's that time of year, when summer still seems so far away... but those darn calendars, they fill up so quickly! So I am writing to let you know of a couple important dates that you will not want to miss. 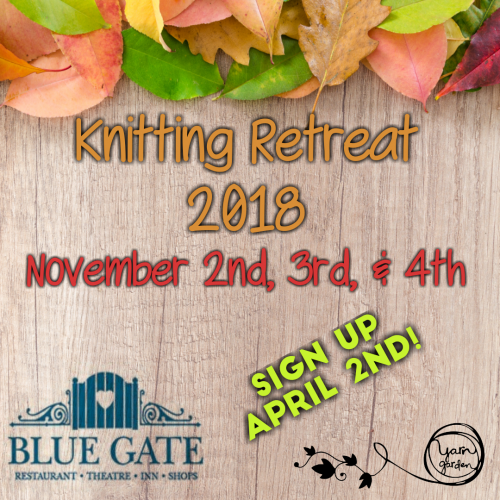 Monday, April 2nd at 7:00 pm - Sign ups open for the knitting retreat on YG's website only. Set an alarm! Saturday, April 21st - This is the inaugural LYS Day, and YG has so many exciting things to reveal that day! Friday, November 2nd through Sunday, November 4th - YG's annual Knitting Retreat. 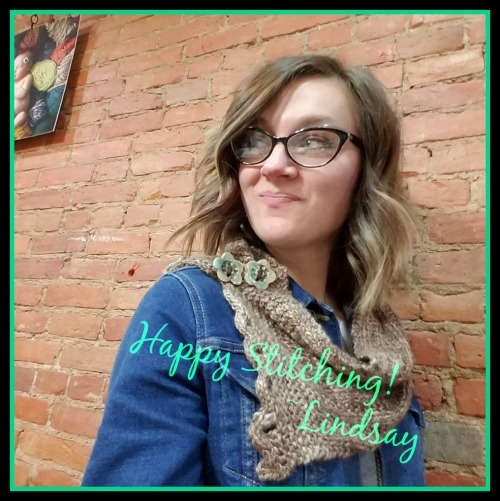 Join me in Shipshewana, IN for a weekend of stitching, laughing, eating, and general shenanigans with 40 other like-minded people. YG's retreat has evolved to become a relaxing weekend away from our everyday life, involving as much or as little stitching as you would like, but always including many laughs, many opportunities to squish beautiful yarn, and great company (oh, and the food. So delicious!). More details will be posted in the coming weeks, but for now, save the weekend of November 2nd, in your calendar, and set an alarm for Monday, April 2nd at 7:00pm. Sign ups will be available then, and we always sell out quickly (last year, all 40 spots were filled in less than 24 hours!). I look forward to spending the weekend with you and 39 more of my closest stitching friends! Click on the image below for details! 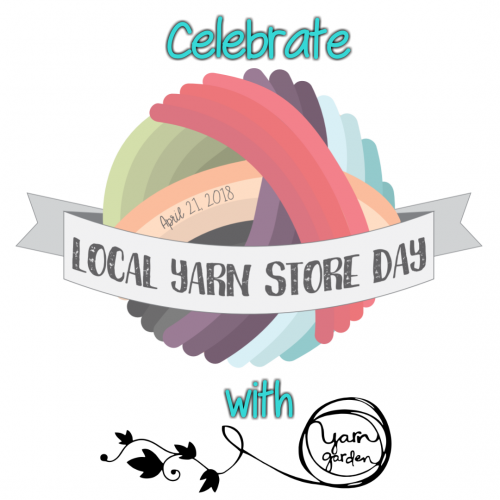 Local Yarn Store (LYS) Day is a brick-and-mortar yarn shop appreciation day created by TNNA (The National Needlearts Association). The inaugural LYS Day will take place on April 21 and is designed to show support for small businesses while bringing together a unique community of knitters, crocheters, weavers and spinners to drive awareness and celebrate the craft. LYS Day will feature items from your favorite yarn companies and designers, only available at brick-and-mortar LYSs like Yarn Garden. A few examples of what you'll see at YG are exclusive colors from dyers like Wonderland Yarns, Stitch Together, and The Fiber Seed... and I'm also plotting a super secret collaboration with two of my fiber biz besties, that you will only be able to buy IN STORE! You'll see more sneak peeks as the day gets closer... but trust me, you'll want to be there! AND... YG will be celebrating one year in the new Garden! Even more reason to throw a party!! If you've been in recently, you've probably seen the Blossom line of adorable yarn from Hayfield. As you knit, it creates a beautiful flower design all by itself! However... it was kinda feminine, with no real options for little dudes. Well, guess what just arrived? Little dude colors! 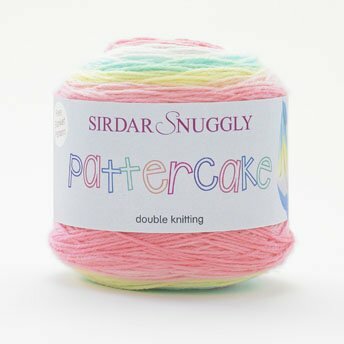 Check out the link below to see the details of these three kid-friendly yarns for your next project. 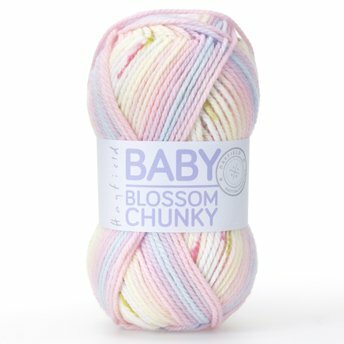 Hayfield Baby Blossom DK is an incredibly pretty yarn, each of the gorgeous shades has a dainty flower print effect that appears as you knit! 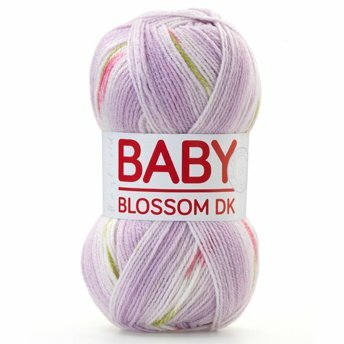 Hayfield Baby Blossom DK has an acrylic nylon blend, is machine washable and will knit to all Hayfield and Sirdar double knitting patterns.